Windows Vista reaches the end of “extended” support on April 11th, 2017. It couldn’t be too soon. The end of ‘Extended Support’ means there will be no more security patches, and no online technical assistance from Microsoft after April 11th. Existing support pages will still be available online, but will no longer be updated. Google Chrome ended support for Vista back on April 1st, 2016. If Microsoft follows the pattern of Windows XP, phone activation for re-installs will only be available from the automated system, and not from an actual human on the phone. If you are still running any Vista-based computers, it’s time to upgrade them, retire them or disconnect them from the Internet. Most computers that shipped with Vista can run Windows 7 faster, and many can run Windows 10. (Call any local tech for help identifying if any particular system is worth an upgrade.) And if there are still any Windows XP machines out there, it’s time to melt them down. Secure erasure and safe recycling is free for my customers. Microsoft Office 2007 will reach the end of extended support October 10th of 2017. If you’re running Outlook 2007, plan ahead. Running an unpatched email program isn’t safe. Now is a good time to switch to Thunderbird, or upgrade to Office 2016. 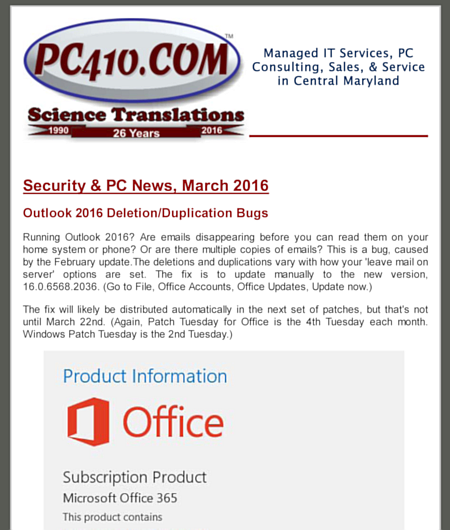 PC410.com maintains a short list of the end-of-life dates of the most popular software products, here.